Forgeries masquerading as 'used for research' stamps in online auction offers. I have frequently reported on Machin definitive stamps which appeared to be, or definitely were, forgeries. And at the end of November I reproduced the press release from the Charity Commission suggesting that charities should not be selling kiloware because it could enable people to mine the sacks for uncancelled stamps which could be resold for reuse. If you've looked at GB stamps on eBay you have probably seen the occasional (or many!) offers for used but uncancelled stamps which are being sold - either "for philatelic research and not reuse" or without that caveat, or affixed to supplies of envelopes for reuse. And there was the prosecution of a couple for laundering stamps and reselling them for reuse. Recently I was shown a selection of forgeries available online. But there are others who don't go to that trouble as shown in the pictures here. This sheetlet of 25 1st class country definitives (including, bizarrely, the Welsh flag stamp) look reasonable, but why are they on the same sheet of glossy backing paper? Because they are self-adhesive! Of course the only time they were issued as self-adhesive was in Smilers/Generic sheets - but not with that font. All - except the centre column - have the denomination in the new 2018 font. Once they are affixed to an envelope, or package, would anybody notice that they were not quite right? Probably not. They are apparently printed in larger sheets because the right-hand edge has the impression of die-cut perforations: it seems that the stamps were printed at least 11 stamps wide, and one column was removed before being cut into sheetlets of 25. On the right, the original £5 from 1977. On the left, the 2017 Accession commemoration with a paler head, and iridescent printing. In the centre, a self-adhesive version of the Accession stamp with the original type of head, but also with iridescent printing. 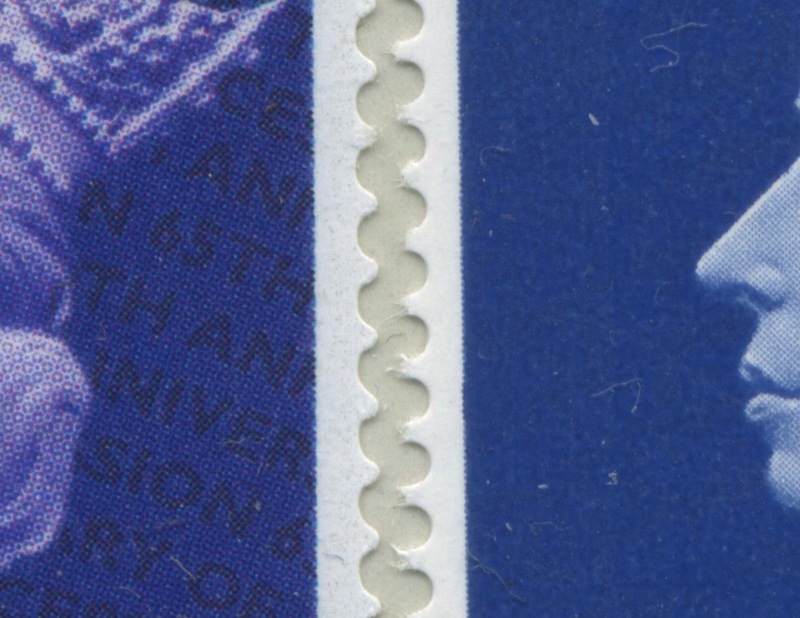 In the picture below the 2017 and self-adhesive stamps are reversed - and you can certainly see the iridescent printing, or however it is created. If it is smaller packets, not needing a £5 stamp, then how about some more country definitives, the £1 or £1.05 - and they'll do for letters to Europe as well. 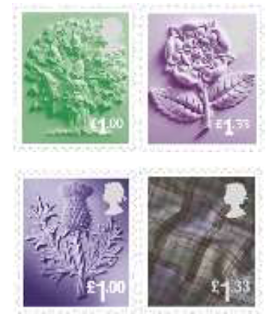 In all cases the stamps on paper are unused self-adhesive forgeries, the others are genuine with ordinary gum. Notice the very poor colour matching, and the reversed-out value on the Scotland stamps, instead of it being in silver. What's very odd is the England stamps. Can the genuine colour be so hard to reproduce? Or have the forgers been given some Royal Mail publicity images to colour match. Those are the stamps which really stand out as being 'wrong'. 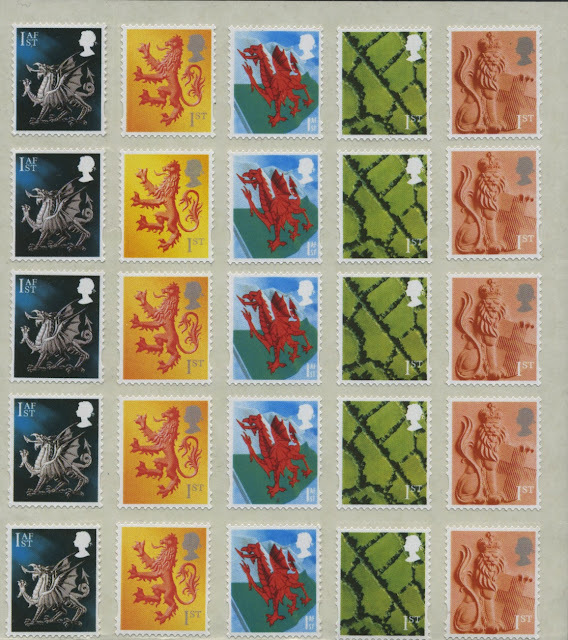 These are just two of the colour error pictures that Royal Mail sent out or published in their Philatelic Bulletin. 2nd class stamps have also been forged - again, self-adhesive, with new font denominations. Earlier I showed some Christmas forgeries, including this one which was too small. Would a user of stamps recognise any of these as being forgeries? Probably not. Would Royal Mail Revenue Protection (RP) recognise any of them - aside from the fact that there are no phosphor bands - or even imitation ones? On non-machineable packets they would probably not be flagged up to RP anyway. Royal Mail really do have a problem, and not just with laundering of pre-used stamps! The crooks hsve done well to find any England definitives to copy, particularly the 2NVI with the new font! 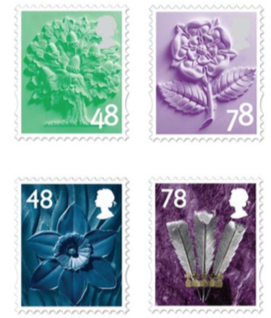 Given the colour error on the England Oak Tree stamps and the poor definition of many of the stamps it seems that one source for the images has been Royal Mail's website or publicity material. Actual stamps not needed!